How my Favorite Band Lead me to Think of St. Francis of Assisi | The Size of a Mustard Seed. Matthew 17:20. My on-my-way-to-school routine is incredibly unoriginal. I hop into the car, with my dad driving, and pop out my phone. Reaching for the audio cable, I begin to figure out with what song I am going to start off my day. The choice of song usually consists of my current obsession in my little world of music. Currently, it is Rend Collective’s new album “The Art of Celebration”. They have such an incredible talent for writing Christian music. The lyrics are beyond beautiful and poetic, the way it should be when it comes to music that talks about such extraordinary things. And yes, in case any one was wondering, I am in love with folk music as well. So one can see why I love their music oh so much. “All that I am for all that You are, my Lord. All that I have for all that You are, You’re the pearl beyond price, greater than life. All that I am for all that You are.” St. Francis longed to become more and more like Christ every day. He poured himself out in love for the poor. He did not serve the poor because he had something against the rich, but because he saw that in the poor Christ is so visible. He longed to bring Christ to the world, and thus he was a gifted preacher. Although, he would be able to do neither of the above without the incredible life of prayer that he had. This was the source of his being. From prayer he received all the graces necessary to serve and evangelize. In using this beautiful equation of prayer and then service, he became a mighty saint and a light to the world. Francis truly was like the merchant who upon finding the pearl of great price, sold all he had to buy it (Matt 13:46). 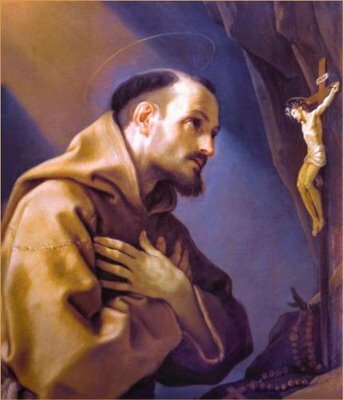 Contrary to popular opinion, St. Francis did not hang out with animals all day long (although he did have a special taking towards them), as we can see his life was much more heroic than only this. This reflection is only a taste into the beautiful story of the hero who was St. Francis of Assisi. There are so many things that should be mentioned when speaking about his life. All the events he experienced. All the things he said and did. This could truly go on for hours, so much so that God willing in the future we will revisit his awe inspiring life. Even though this post does not contain the every detail of his life, this information is the core of who Francis was. His grace filled conversion. His faith in our Lord. The humility of his life. His prayer life. Everything else are only (incredible) details of his story (even the adorable animal stories). From these amazing things, Francis went on to do countless other incredible things. These few things lead him to become a hero (a.k.a saint). Let us pray for the grace to be like St. Francis. To trust in God the way he did. To have the courage to follow God’s will for us. To always serve with a joyful heart and to humbly bring Christ to everyone we know. To have the courage to strive toward sanctity. It’s only in surrender that I’m free.